Or better put, it can be operationalized, but in far too many ways, many of which will no doubt be contradictory. 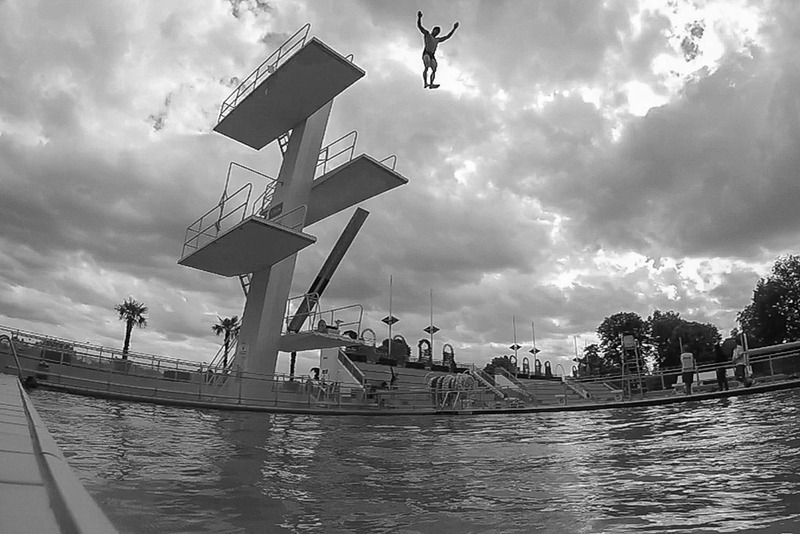 For I would maintain that, despite sounding like an ambitious goal, the value of “highest” necessarily lacks all substance, inasmuch as it functions like Tillich‘s famous definition of religion as an ultimate concern: these are rhetorical and not precise, analytic terms, that are used merely (1) to create consensus among an otherwise divergent group (inasmuch as the lack of precision can, to some extent, effectively contain unarticulated differences in interpretation) and (2) to trump any specific instance that others propose but with which the speaker disagrees (“Sure, that’s a high dive, and it may even be higher than that other one, but it’s not the highest”). Like the category of experience, as phrased by Robert Sharf in his well-known essay, the category of highest strategically denotes an “indeterminate terminus for the relentless deferral of meaning” (p. 286). Kind’a like the fish that got away, about which people tell so many stories — it’s always that much bigger than the one they caught. So I should correct myself: given this lack of specificity, it’s not that there’s not really all that much left to say at this point in the document. Instead, there’s far too much that can still be said — for, lacking a definition of highest, who knows which (or whose) standards will win the day in each situation. 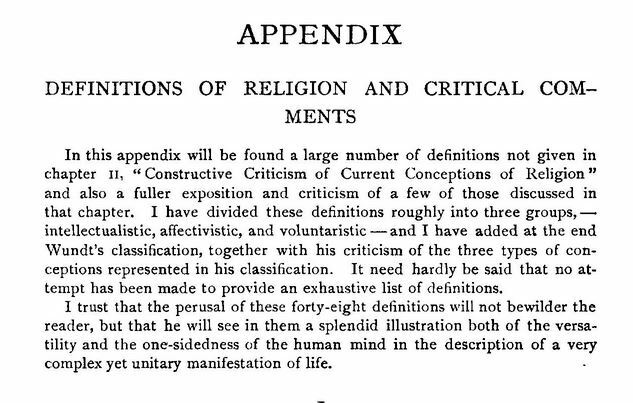 All of which brings to mind Jonathan Smith’s comment, in his widely cited “Religion, Religions, Religious” essay, concerning the famous list of almost 50 different definitions of religion that James Leuba listed in the appendix to his 1912 book, A Psychological Study of Religion: Its Origin, Function, and Future. So it’s not that we can’t specify what counts as our field’s highest standards; instead, such unspecified language opens the door to a possibly confusing competition among alternatives, each of which is advocated by people with different interests, different conceptions of the field, and different understanding of what it means to be a professional. in which its leadership has, over the years, consistently worked to contain what I’d maintain are actually irreconcilable approaches (inasmuch as some constitute data for yet others), this is all quite understandable, of course. Like politicians trying to unite competing factions, we have no choice but to deploy vague language that each side will end up hearing as they like, and thereby (ideally) be satisfied, all in hopes, presumably, that a balkanized outcome will, come the annual conference, contain disagreements behind the doors of each discrete program unit. That this is not so easily managed when each issue of the Academy’s journal comes out, though (with a table of contents, and types of arguments, that all can see and read for themselves), is pretty obvious — making the editor’s role unenviable, in my opinion, inasmuch as an impossible task is set before anyone invited to accept that challenge. So it’s no wonder that the AAR declines to “adjudicate claims of misconduct”; for apart from the venues that already exist to air professional complaints and grievances (which, of course, includes not just a campus’s own procedures but the services offered by the AAUP — both of which the final bullet point names — along with the civil and criminal court system), an Academy that tries to contain such divergent approaches would be well advised to steer clear of adjudicating disputes over what counts as, say, a fair interpretation. In fact, that’s exactly what this document is already doing, given how far it steers around precision in the terms it uses. For, as argued just above, the contenders are just too varied; taking a stand on which should count as normative and thus authoritative will topple the big tent’s inclusive façade. The two-fold purpose of this statement is to generate conversation about the challenges of research about religion and to provide guidelines that establish standards of professional conduct and identify researchers’ responsibilities. — it seems to me that, even acknowledging the no doubt sincere and best intentions of the committee, this is not the role that a document like this will end up playing in such a diverse professional association. For given the necessarily unspecified and thus almost limitlessly inclusive nature of the principles that animate these guidelines, implementing them will not steer traffic but, rather, drivers will go wherever they wish and cite their reading of the document in their defense. Trying to anticipate that confusion by more narrowly specifying the document’s key terms and assumptions, thereby putting the Academy in the position of being able to clearly identify and, if it wishes, police infractions, will lead to a better document, yes, but will so eliminate some drivers from the road that the “come one come all” nature of the organization will take a rather big hit. So, while continually calling upon the committee to rethink this document — something I still advocate — I also understand why they might prefer not to take that plunge and, instead, just ask us all to be honest and do good and follow the law. For putting any more meat on those bones risks alienating the competing constituencies (each of which is armed with one of those 50 definitions of our object of study) that have come to constitute the organization. All of which tells me that, at the end of the day, the document is itself a datum inasmuch as it is an act of social formation, since it’s more about containing disagreements and contradictions within the organization than proactively governing how it is that we carry ourselves as researchers. 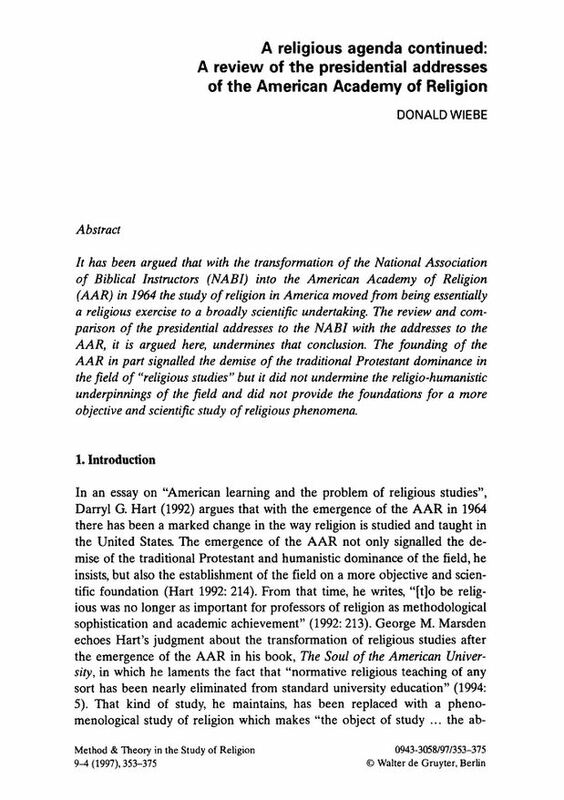 This entry was posted in Faculty Blog, Relevance of Humanities, Religion in Culture and tagged Adjudication, American Academy of Religion, American Association of University Professrs, Consultation, Misconduct, Research Responsibility, Social Formation by Russell McCutcheon. Bookmark the permalink.